so small -you'd walk right by. till something caught my eye. it was a modest yellow sign. please come on in and dine! was the sign talking to me? but what if the tacos are lame?! a pinata hung in the corner. "Ms. may I please take your order?" 1 chicken, 2 pork, 1 steak. I hope this was not a mistake! the patrons were having a ball! Bill Clinton hung on the wall. he must have stopped in here to eat? maybe we're in for a treat! and handed me over our meal. by the size of these things, what a steal! the pork tacos stealing the show! completely out of the know! the city we loved so much. but that taco - I needed to touch! and to touch that sign on the door. that taco sign on the wall. These Shredded Pork Tacos a' la Martha Stewart (though much more visually refined than those we ate in New York) come damn close to matching that pork taco flavor we miss so much! While we followed the recipe exactly (slow cooking it on the stove) other reviews say it makes an AMAZING crock pot dish! We serve it atop two warm corn tortillas, with cilantro, chopped onion, queso fresco and radish. Unbelievably fresh, authentic tasting and delicious... this super affordable, versatile dish is sure to impress your family and friends. Thanks Martha! 1.In a large (5-quart) heavy pot, heat oil over medium. Add onion, garlic, thyme, oregano, and bay leaves; season with salt and pepper. Cook until onion has softened, about 5 minutes. Stir in tomato paste. Add pork, tomatoes (breaking them up) and their juice, chipotle, and 1 cup water. Bring to a boil. Reduce heat; cover and simmer until meat is very tender, 2 to 2 1/2 hours. Discard bay leaves. 2.Using tongs, transfer meat to a large bowl; shred with two forks, discarding any large pieces of fat or gristle. Return meat to pan, and simmer until sauce is thick, 30 to 45 minutes more. Season, if necessary, with salt and pepper. Proceed to next step, or cover and refrigerate, up to 1 day. 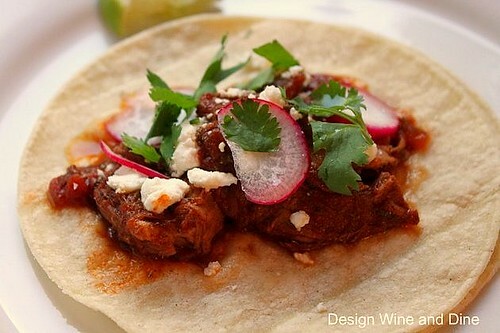 3.Spoon pork and sauce into toasted tortillas, using 2 tortillas for each serving; top with queso fresco and cilantro. Serve with Crunchy Slaw with Radishes, if desired. Apart from the beautiful ode and the yummy dish you present in this post, you give a valuable lesson to all. Most of the times we search to big fancy things in order to give us happiness and satisfaction and forget to just turn around and see that real beauty can be found in small humble things just in front of us. I love your ode! A similar thing happened to me too with an old shack next to a gas station - serving the most delicious Italian food. The tacos look fantastic - great recreation! That was fun to read! This looks amazing. I think we would love this recipe. This is possibly the cutest post I read all day! I loved the ode. And what a thing to write one to! The meat in those tacos looks perfect! How cool that you were able to duplicate your favorite restaurant taco - with a Martha Stewart recipe no less! Great read - felt as if I was reading a poem. This looks like a great recipe for a tailgate too! YUM! Taco poems. Two great things that surprisingly go great together.